All day Friday my hip was kind of bothering me. I didn't really think much of it and got the weekend started celebrating two of my favorite people's birthdays, Blaylock and Fez! 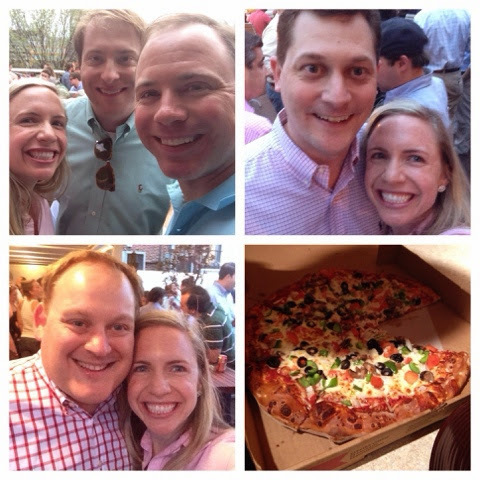 We had cocktails on the roof of restaurant on Barack's Row and it was so nice to be outside. Spring has finally sprung! I also reunited with a lot of my fellow Team Sullivan friends so all in all it was a perfect start to the weekend. Later, Josh took me to several party stores to find the last minute items I needed for the Spring Event I was helping plan. It was then that I knew something was seriously wrong with my hip :( Originally, I had planned to go to CF on Saturday morning (like always) but I knew at that moment that I needed a break. Our Friday night ended with some veggie pizza and me burning a CD for the first time in like seven years. Happy Birthday Fez and Blaylock! The next morning, my hip was in even worst shape, but Josh came to the rescue. He packed the entire Jeep with all of the things I needed for the event (which was a lot), made an ice run, and packed the ice chest. I couldn't have done it without him. Then when I got to the event, all of the volunteers and my co-partner, Brittany, also went above and beyond! Everyone came together and really put everything they had into making our Spring Fair perfect for all of the Langley Consumers. They had so much fun and so did we! 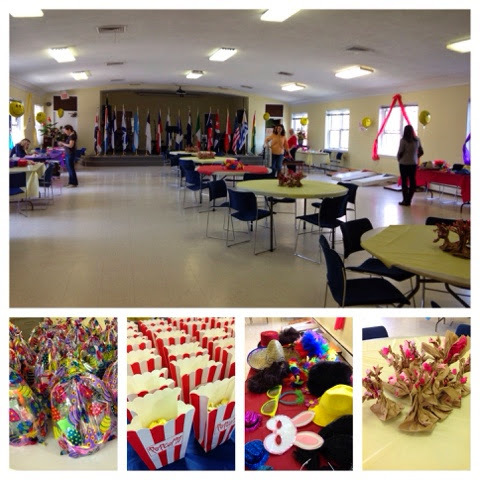 We had a carnival theme! When the Spring Event was over, I reunited with Josh and we went to Palm "Saturday" Mass. We then made an attempt to go check out the Cherry Blossoms but it was a ZOO! 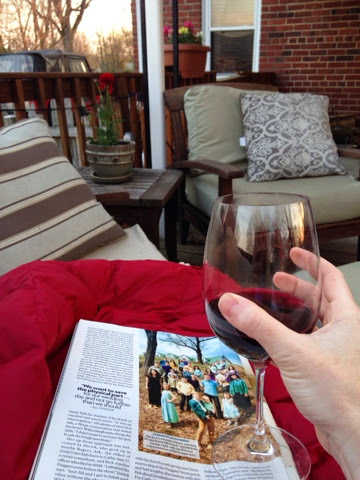 So we went home instead where I lounged and drank wine outside. This was much needed after the busy day. 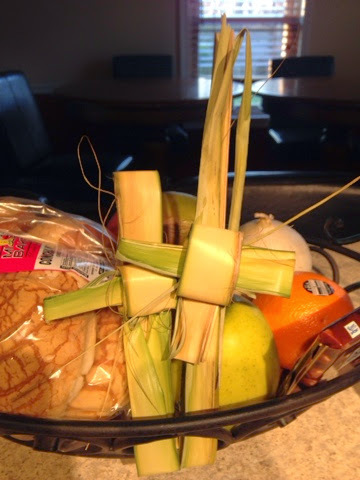 My attempt at making crosses out of our palm branches...I need some help. On Sunday, we had a big barbeque with all of our friends. Josh smoked brisket, venison sausage and ribs. 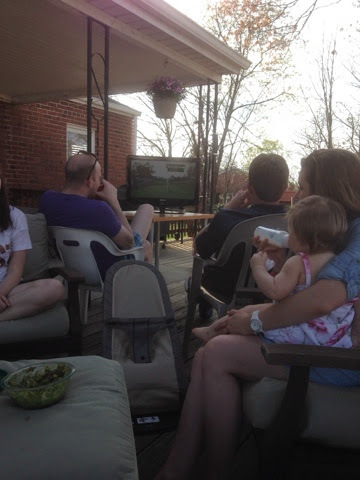 We had tons of food, drinks and cheered on Bubba at the Masters. It was a day where I just enjoyed being in the moment and didn't think too much about pictures for the blog and what not. I couldn't have asked for a better Sunday! The weekend ended with some Game of Thrones (all I can say is WOW) and me trying to stretch out my still tight and very sore hip. Your palm crosses look good! I can't do it at all!